Caught July 21/2012 at 10:30 a.m. No steel leader and only 40 minutes into fly in fishing week at our outpost cabin on Kay Lake. We were fishing for Smallmouth Bass and Jodi had a Rapala slash bait on. Thinking it felt funny, heavier, but not as lively as a Smallmouth. She was scared to death to hold this fish at first. Its gills scratched blood from all four fingers, but she never even flinched or let go, wiped off the blood and we released the Musky unharmed to grow up and fight another day. If you’ll notice her beautiful natural nails! Fished 12 hours, everyday. What a trooper. Jodi also caught a 3.25 lb Smallie on a hot pink 5 inch diving crank bait. I laughed at her when she bought it, but she had the last laugh, as it repeatedly worked well. I have had luck with bubble gum and super flukes at other Canadian Lakes, but not here. Kay Lake Smallies loved clear super flukes with metal flake in them, and many other things as well. Great weather, fish hitting all week, good variety of depths. 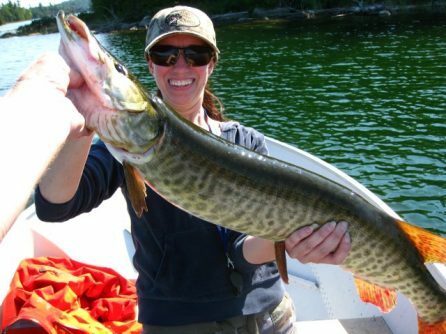 One day we went for Musky and caught eight in a three hour session. Pilots at Nestor Falls Fly-In Outposts were very smooth at landings and your staff was very friendly and helpful. Cabin was beautiful.